Tracey Curtis-Taylor has followed in the footsteps of pioneer Amy Johnson by completing a 21,000-kilometer solo flight from England to Australia. 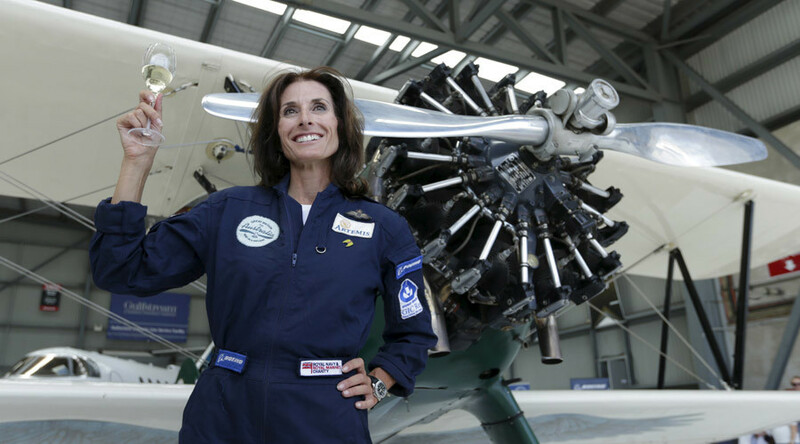 Curtis-Taylor, 53, took to the skies in her 1942 Boeing Stearman Spirit of Artemis aircraft from Farnborough, Hampshire, in October. She traveled across 23 countries, making 50 refuelling stops, in her open cockpit biplane before landing in Sydney, Saturday. “I need a drink. And I need a hairdresser,” Curtis -Taylor told AFP News Agency after she touched down. Curtis-Taylor was the only pilot to fly the vintage bi-plane, but she had a support team of engineers travelling with her in a separate aircraft, as well as a camera crew, who would sometimes sit in with her. Her route took her across Europe and the Mediterranean to Jordan, over the Arabian Desert, across the Gulf of Oman to Pakistan, India and across Asia. The idea of the journey was to emulate Johnson’s trailblazing flight by flying with an open cockpit, with basic period instruments and a short range between landing points. The 26 year old, who became the first woman to fly solo from the UK to Australia in 1930, has been a constant inspiration for Curtis-Taylor. This is not Taylor-Johnson’s first successful attempt at following one of the greats. She flew 13,000 kilometers solo from Cape Town to Goodwood, West Sussex, in 2013 to recreate the 1928 flight of Lady Mary Heath. So what’s next for this adventurer? Onwards to New Zealand for her mother’s 80th birthday and then it’s back to Artemis and the crew in Seattle for a coast-to-coast expedition of the US. “Why not keep going? Life should be about big projects,” she said.